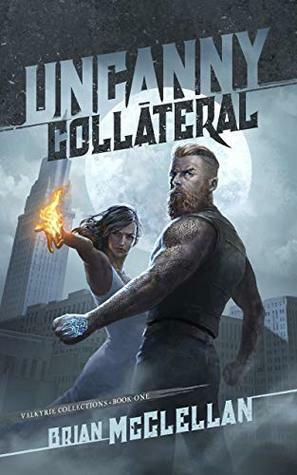 Thanks to the author for an advance reading copy of Uncanny Collateral (Valkyrie Collection #1) from the author in exchange for an honest review. Receiving this ARC did not influence my thoughts and opinion on this novel. I did not have a good impression on urban fantasy due to my previous encounter with An Unkindness of Magicians. I am thus skeptical towards this genre. But I really enjoyed reading Brian Mcclellan’s work (especially his notorious Powder Mage series) and decided to give this a try. I have to say, Uncanny Collateral is so much better than An Unkindness of Magicians. This book is only 145 pages long and it is really fast paced with a lot of action going on throughout the book. The world building, magic system, characters and plot development are all very well executed despite the fact that it is only 145 pages long. I am amazed by how Brian balances all these elements and keeping this story so action packed and fast paced in such a short story. It is truly a page turner and an easy fun read. The ending of this book has also left me wondering the past of Maggie and Alek. Highly recommend this book and I can’t wait for the release of the second book! Good job Brian! You changed my views towards urban fantasy! Uncanny Collateral definitely deserve a 4.5/5 star rating from me. For those who are interested you can grab a signed copy of Uncanny Collateral from http://www.brianmcclellan.com/bookstore/uncannycollateral which is releasing on 4/2/2019! Glad this gave you a better impression of urban fantasy. great review!